I open an new composer and select ANSI A for my paper. The notation after the name is "Letter; 8.5inx11in", but the width and height are displayed in mm, and the units selection is grayed out, so I can't change it. The rulers at the top and left of the layout are in mm, and the parameters for "Snap to grid" are also in mm. 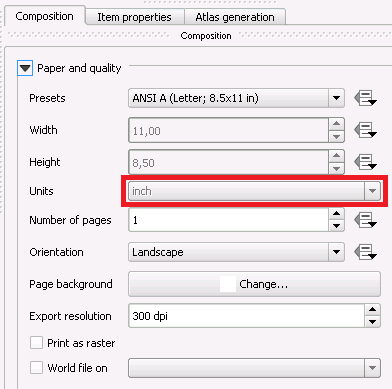 If I then select "Custom", I can select inches for units, and the Width and Height display as 8.5 and 11. However the rulers in the layout are still in mm, as are the units for the grid. Can the entire composer project be converted to inches? You can't (as of 2.12). The "units" selection in the composition properties tab only changes the units for the display page size. Everything else is hardcoded to use mm (ie rulers, item positions, item sizes, etc). This is possible in QGIS >= 3.0. Not the answer you're looking for? Browse other questions tagged qgis print-composer units or ask your own question. Are there limitations for QGIS Composer images larger than 32768 pixels? QGIS field calculator returning results in different units? Getting the height and width of labels in QGIS? How to get WYSIWYG of raster layer in print composer in QGIS?